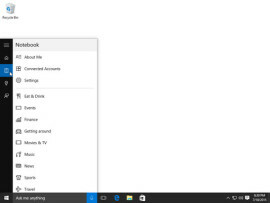 Windows 10 adds Cortana, a digital personal assistant, to the Start menu’s Search box. Some people enjoy how this little robot helps them keep abreast of the latest news, reminds them of upcoming appointments, and recommends nearby events and restaurants. Others find Cortana to be an annoying invasion of privacy. No matter which camp you fit into, here’s how to either turn off Cortana completely or arm the robot with enough personal information so that it can help you manage your busy life. Privacy addicts won’t like Cortana, because the little robot can only help you by learning detailed information about your life. That includes knowing your location, voice, contacts, calendar details, and messages. That’s a lot of information to give up. To set limits on Cortana’s knowledge, click inside the Search box next to the Start button. When Cortana appears, click the Notebook icon from along the Search box’s left edge, shown in the figure below. Suggestions, Ideas and Reminders: The top switch simply toggles Cortana on or off. If you find Cortana annoying, click this toggle switch to Off to make Cortana stop bugging you. Then click the Manage What Cortana Knows About Me in the Cloud link to delete what Cortana has already learned. If you find Cortana helpful, however, this switch must remain turned On. Hey Cortana: Cortana can constantly listen through your computer’s online microphone. When Cortana hears you say “Hey Cortana,” followed by a command, the spunky robot carries out your command. To work that magic, though, Cortana becomes an eavesdropper. If that creeps you out, click this toggle switch to Off. Cortana still works fine when you type commands into the Search box. Find Flights and More: Flipping this switch on authorizes Cortana to read your mail and calendar entries. Then Cortana can remind you about flight information and package deliveries. Taskbar Tidbits: Cortana tries to be helpful and friendly by offering greetings and information in the Search box. If that becomes annoying, turn this to Off. Along the bottom of the Settings pane, several links take you to Bing, where you can tailor how much information Cortana and Microsoft know about you and your life. When you click the Search box, Cortana dishes up information pertinent to your particular situation. You see the local news and weather, for example, as well as breaking news, stock market information, and lists of popular nearby restaurants. Eat & Drink: Turn on this category to see recommendations on nearby restaurants and bars. Other toggles let you see recommendations from Foursquare, filter places by their atmosphere (kid-friendly versus romantic, for example), and add your preferred cuisines, price ranges, and driving distance. Events: Here, you tell Cortana which events you prefer. When the window opens, choose from arts, business, community, dance, education, food, shopping, sports, and other categories. Finance: List your favorite stocks in here to see quick performance charts whenever you click the Search box. Getting Around: Turn on this category, and Cortana lets you know when it’s time to leave for your next appointment. (The timing is based on up-to-date traffic reports.) You can also tell Cortana to adjust the predictions based on whether you drive or take public transit. Movies & TV: Switch this on to see show times at nearby theaters, as well as trailers for the latest movies. Music: When turned on, Cortana offers song recommendations, but there’s little tailoring for adding your favorite artists or even music genre. News: Almost everybody wants to see the latest news. Click here to filter news by local, breaking, or even add keywords so you won’t miss stories on your favorite subjects. Sports: Add your favorite teams here, and Cortana keeps you up-to-date on game scores and upcoming matches. Travel: When turned on, Cortana looks for flight listings and destinations. It then lets you know of flight delays, as well as weather reports from your destination. Weather: This section lets you monitor your own city’s weather, of course, as well as the weather in any cities you add. Microsoft plans to update Windows 10 constantly with security patches as well as new and enhanced features. Don’t be surprised if this list of settings changes slightly. Cortana is new to the desktop, and Microsoft will undoubtedly begin fine-tuning it.